My latest obsession: lemons, lemons, lemons. They are so flavorful and fresh, I have been putting them in just about everything lately, so why not cupcakes? Whisk together melted butter, honey and eggs. Scoop into 12 lined cupcake tins. Bake for 20-25 minutes, until they test clean with toothpick. Cool and frost with Vanilla Yogurt Frosting. Top with fresh berries and additional lemon zest if desired. *for an even more lemony surprise, fill the center of each cupcake with lemon curd. I’m going to try these with a strawberry or raspberry sauce or lemon glaze.. mmm looove lemons! I make a sour cream and lemon pound cake with lemon glaze that my whole house loves. Can’t wait! Just made these Sunday night – they turned out great! And I have enough made to have one with each lunch – the perfect healthy treat! Perfect amount of Lemony-ness. I am addicted to lemon-flavoured things too. Thanks for another great recipe! Did you try this with coconut oil? 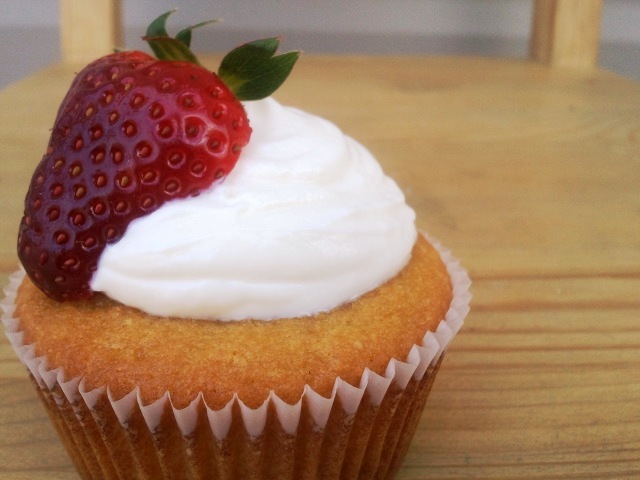 These cupcakes have great taste and texture! I would like to know how to fill these with the lemon curd?? Is it after they are cooked? I don’t make fancy desserts very often!